Are you heading out on a vacation this summer? If so, then a “to do list” a mile long is probably taped to your fridge. Summer vacations only come around once a year, and so taking the time to assess your planning and preparation ensures a good time is on the horizon. But do you ever notice how we always seem to take the time to check and double-check the preparations for the big events in our lives (like vacations)… but we rarely take enough time to truly analyze the day-to-day workings of our piano studio? 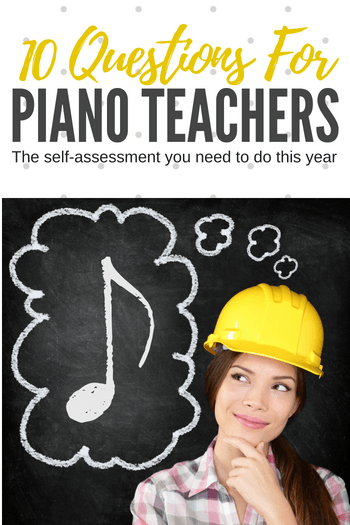 Teaching piano can be an exhausting job and at the end of the term we tend to shut our musical brains down until our students return in the fall. Unfortunately, when this happens we miss out on the opportunity to assess the past year in order to determine what helped (or hurt) our studios. Fortunately, with help from today’s post, you can take a quick moment to figure out what is not working in your studio, what is working for your studio, and what you should do in the fall to skyrocket your studio numbers! While self-reflection may not come easy to you, these questions will make it painless! Simply take 10 minutes to reflect on the 10 questions below. Think about your responses to each of the questions then grab a pencil and a piece of paper and make a list of your responses. When you’re done… pin that list to your fridge (and finish reading to the end of this post). How did I build community in my studio this year? What goals did I accomplish that I had set for myself? What did I accomplish that surprised me? What was particularly stressful this year and how can I let it go next year? What did I use or do in my studio that caused the most positive impact? Which parents would I like to build relationships with next year? How can I “value add” to my lessons next year? What were my biggest “time wasters” in lessons and in administrative tasks? What aspect of my students’ progress makes me most proud? Using the students and the materials I already have, how can I increase my earnings next year?